A pearly white smile can be an excellent confidence booster. Yellowing or stained teeth are unpleasant to look at and can negatively affect your overall look. 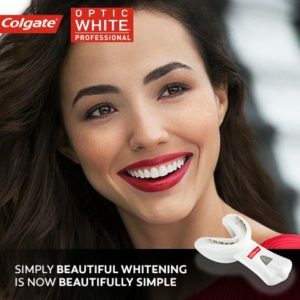 The Colgate Optic White® Professional Whitening System is a quick, safe and gentle way to restore the natural color of the teeth with minimal discomfort. Colgate Optic White® Professional whitening system has been proven to be more effective that BrightSmile®, Zoom®, or any other in-office whitening procedure. Only one sixty (60) minute appointment is needed to apply a 35% hydrogen peroxide gel in a specially designed device that utilizes electrolysis to enhance the uptake of the gel into the teeth. How Can Colgate Professional Optic White® Help Me? The best candidates for the Colgate Optic White® Professional whitening procedure have strong, healthy teeth and gums. If gum disease is an issue, this needs to be treated prior to the gel application. Whitening treatment may not be a good option for patients with highly sensitive teeth, thinning teeth or teeth that exhibit deep inorganic staining. What Preparation is Necessary Before the Colgate Optic White® Professional Whitening Treatment? The Colgate Optic White® Professional whitening treatment elicits the best results on clean, healthy teeth. Therefore, a thorough cleaning is recommended prior to the treatment, to rid the teeth of plaque, tartar and rotting food particles. The dentist will always thoroughly examine the teeth while performing the cleaning to check for any fractures, inflammation or decay. Photographs might also be taken of the teeth prior to the bleaching procedure. This makes “before and after” comparisons more evident. Though the whitening procedure only takes an hour in the office, the Colgate Optic White® Professional teeth whitening provides "touch up" gel to continue the whitening process a few days after your treatment. This extra gel, along with the whitening device will be sent home with you and is included in the fee. Colgate Optic White® Professional whitening treatment is long lasting and effective, but stains can quickly reappear on the teeth – particularly if tobacco is being used. What Does Colgate Optic White® Professional Teeth Whitening Treatment Involve? A re-tractor is placed inside the mouth to fully expose the teeth. A hardening resin is applied to the gums to prevent the bleaching gel from irritating the gums. The gel is placed within the whitening device and the device is placed on the teeth for ten minutes. The dentist or hygienist will check whitening progress as you go along, your dental professional will be present throughout the entire procedure with you. The gel is removed and then more gel is applied for another ten minutes. The gel is again removed and then more gel is applied for an additional ten minutes. The final gel application is inserted into the device and is activated until complete. The teeth may look incredibly white immediately after treatment due to mild dehydration. The actual color of teeth will become apparent when the teeth have had 48 hours to re-hydrate. If you have any questions or concerns about the Colgate Optic White® Professional Whitening System, please ask your dental professional at your next visit!